Mexico alone is a fantastic vacation choice – beautiful beach access, delicious authentic Mexican food, historical sites, the loving and spicy Spanish culture, plus good prices for the whole family. But let’s be honest, sometimes you just need some quality, alone time with your loved one. The El Dorado Seaside Suites is the perfect stay for an ultimate luxurious and well-deserved vacation for you and your other half. This is just the beginning of many reasons why the El Dorado Seaside Suites should be your number one resort choice. Adult’s Only: You read that right. The El Dorado Seaside Suites is an adult’s only paradise ideal for a couple’s retreat. Whether you are celebrating your honeymoon, an anniversary, or escaping from your daily routine, this adult’s only resort is a perfect place for relaxation and for some much-needed pampering. 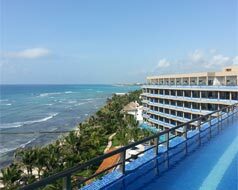 All-inclusive Resort: The El Dorado Seaside Suites is not your typical resort, nor your mainstream all-inclusive resort either. As a Gourmet all-inclusive resort, not only are your accommodations taken care of, but so are your flights and meals! Craving a snack hiding in your room’s mini-fridge? Well dig in because it was included in your resort price. Then, add on to that service by getting El Dorado’s exclusive service and exceptional style and taste. Fine Dining: With 10 specialty restaurants and nine bars, food is at your fingertips and the sky is the limit. Head out casual for an à la carte kind of night or get dolled up for a fancy sit-down restaurant. If going out every night isn’t your thing, order room service and relax indoors. Room Options: There are 192 intimate, beachfront suites each with high quality comfort. Reserve a room with its very own private Jacuzzi or swim up pool to call your own. Activities: Rejuvenate the mind and body at the spa, make snack time a priority, sunbathe on the beach under swaying palm trees, or explore various ongoing entertainment and resort events. If you are looking for an ultimate luxury resort experience for a great price, then look no further than the El Dorado Seaside Suites.